A young Barred Owl clings to a branch in the woods in Danbury, Conn., spring 2016. Here’s the latest For the Birds column, which runs weekly in The Hour (Norwalk, Conn.), The Keene (NH) Sentinel and several Connecticut weekly newspapers edited by Jerrod Ferrari. Throughout my birding “career,” I haven’t had great luck with owls. I get the occasional look at a great horned owl and have only slightly better luck with finding barred owls. I’ve had modest success with snowy owls along the Long Island Sound coast in certain winters, especially during that banner year a few winters back. Short-eared owls, long-eared Owls, saw-whet owls, even screech owls? Hardly a glimpse. But this fall has been pretty good so far in terms of owling. Not that I’ve actually seen owls — even a single one — but I have heard plenty of them. 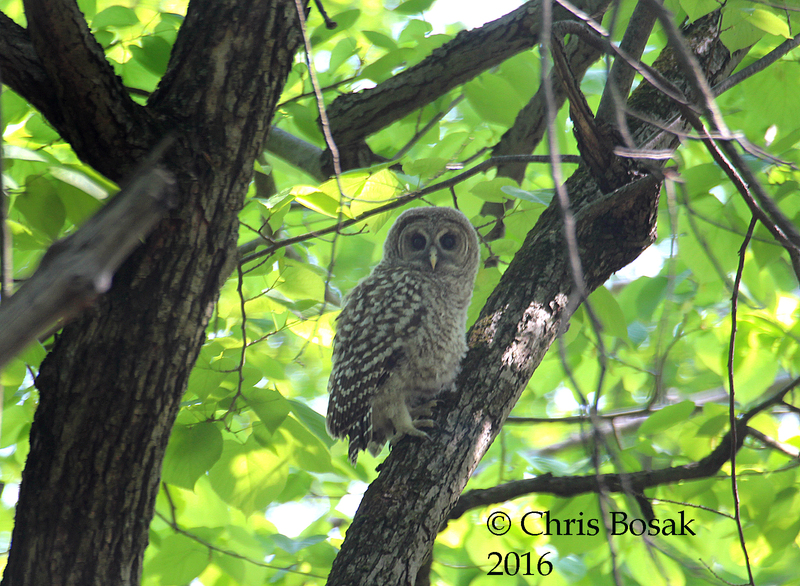 It started about two weeks ago when I heard a barred owl in the woods while I was sitting on my deck at dusk. Then, a few nights ago, I heard a great horned owl. I knew it was fairly close, but I couldn’t pinpoint exactly where it was. Two nights later, I had a great night of owling, and I didn’t even have to leave my yard. I heard two great horned owls calling to each other, one of which was in my side yard. I didn’t see it, as it was pitch dark, but the sound was definitely coming from close by. The owls hooted to each other all night. I know it was all night because I was up most of it worrying about my house cat that happened to get out that night. He picked a great night to get out — the night two great horned owls are scanning the neighborhood. At one point that night, I heard a pair of barred owls in the distance, too. I had never heard any owls from my yard before, and now I was hearing two species in one night. Now back to my cat. Cubby makes a great escape once a week or so and gets out. Like most pets, it’s best not to chase Cubby as he just runs farther away if he feels pursued. Plus, he’s much too agile and fast to catch anyway. Typically, he’s back in a half hour or an hour. At night, his escapes are usually even shorter. But on this night, he didn’t come home right away. I took frequent walks around the yard with a headlamp on to try to find him. No luck. I gave up on that at about 3 a.m. I couldn’t sleep with my cat roaming the neighborhood and the constant sound of great horned owls calling to each other. I was torn between this being an awesome night or a terrible night. I certainly appreciated the owl calls, but in the back of my mind I worried about Cubby. I put my mind at ease by knowing that, yes, owls on occasion will take a cat, but it’s highly unlikely. They are looking for mice, chipmunks, rabbits or similarly small prey. A house cat, while certainly within reason for a powerful great horned owl, is not a desirable prey. Cats are larger than an owl’s normal prey, so owls don’t typically go after cats because of the risks involved. My mind was at ease, but not totally — certainly not enough to fall into a deep sleep. I left the sunroom door open and sliding door to the kitchen open a few inches in the hopes that Cubby would come in. I had to gauge the width of the door opening carefully as raccoons have gotten onto the enclosed sunporch before to get at the bird food. Boy, they are messy. Finally at 4:30 a.m., I was half asleep when a loud “meow” came from the kitchen. It was Cubby, and he was fine. I had no idea where he had been or if he saw or heard the owls. I was just relieved that he was back. I closed the doors and finally fell asleep fully with Cubby curled up at the foot of the bed. The owls kept hooting, and I kept enjoying it, even in my sleep. When I woke up a few hours later, the sun was up and the owls had quieted. I didn’t know if they had left, but I knew they weren’t calling anymore. I have heard them on occasion since, but not every night. I’m not sure if they are looking for nesting sites or just checking out a new neighborhood for untapped food sources, but I’m glad them came along. They are welcome in my yard anytime. I just have to be more careful with Cubby’s great escapes. This entry was posted in For the Birds column, Owls and tagged chris bosak's for the birds, New England owls, Owls by Chris Bosak. Bookmark the permalink.